Becoming a PADI Divemaster is a step to a new level in diving. It brings you new benefits, opportunities and challenges, and with it, new responsibilities as a dive leader. 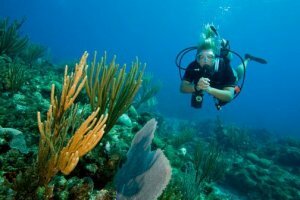 It carries the fun and excitement of adventures spent with divers both less experienced and more experienced than you. It offers the reward of watching others learn and benefit from your experience. And, it offers other rewards as you pursue your career in diving. Begin your dive career- take the first step and become a PADI Divemaster. You may be eligible (after 40 logged dives) to start your Divemaster training after you complete the PADI Rescue Diver course. Working closely with our staff, you will expand your dive knowledge and hone your skills to the professional level. As your skill levels increases so will your confidence. As a PADI Divemaster, you are qualified to supervise and assist with both training and non-training dive activities, such as the PADI Discover Local Diving experience, the Scuba Refresher program and others. Also, after a short internship, you can conduct the confined water option of the Discover Scuba Diving Program. As with many endeavors, you get out of being a Divemaster is what you put into it. But if you continue your diver education, keep up to date with changes that affect diving, and let your love of diving be your guide, here is a promise: It will never be boring! Please join us at PRO NIGHT January 18th and learn all about it. The PADI Assistant Instructor course is a program designed to provide qualified Divemasters with additional training as instructional assistants. Using the background established during the candidate's divemaster training, the Assistant Instructor course seeks to build upon this preliminary foundation. During his or her experience in the course, the candidate will learn, through practical application and hands on experience, how some of the most important aspects of PADI programs function. The Assistant Instructor course is sometimes the first three days of the Instructor Development Course (IDC). This means that after completing the Assistant Instructor requirements you can choose to accept the AI certification and practice your teaching skills prior to continuing to instructor level. When you decide to become a PADI instructor, you only need to complete the remaining four day Open Water Scuba Instructor (OWSI) portion of the IDC to participate in the Instructor Exams ( IE ). Perhaps the most important benefit of becoming an Assistant Instructor is one you won't realize until you become a PADI Instructor. The added - but limited - responsibilities an Assistant Instructor enjoys beyond the divemaster level becomes the basis for expererience with student divers that helps you succeed in the IDC/IE as a certified PADI Instructor. The Dive Shop offers this course as a stand alone class. The Dive Shop and staff like to see candidates gain has much experience as they can. 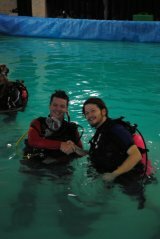 PADI Instructor Development - Start living the dream!